It was way back in 2005 that I first encountered Hamsterley Forest when I started riding my mountain bike. Initially, I really hated the place because I mainly associated it with lung busting climbs as my fitness was improving and, to be fair, that didn’t really change when my fitness reached a level that enabled me to enter the TransRockies mountain bike race in Canada in 2007. Whilst training, the pain of the climbs was the same but my relationship with the Forest had changed to a love hate one. I hated the pain of the climbs on the mountain bike and at the same time loved the beauty of the Forest. Whilst riding I would look at the few houses that were nestled within the Forest and wonder what it would be like to live there, having the expanse of Hamsterley Forest as my back garden, and it was whilst at the peak of my training in 2007 that I first saw that Dryderdale Hall for sale. It was completely the wrong time for Helen and I to consider moving there, though we did look at the details of the house, taking it no further. We just let the opportunity pass us by and gave it very little thought. 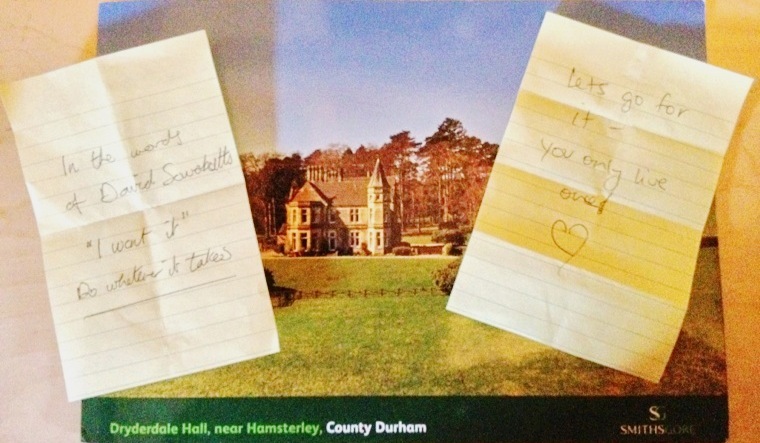 Fortuitously, whilst sat in Mucho Gusto, our regular coffee house in Hexham, some four years later, Helen opened a magazine and found that Dryderdale Hall was again for sale. We had lived at Bankfoot Cottage for twelve years and had always maintained our intention to develop it, however, for many, many reasons we just never really committed to the decision until, in June 2011, we finally decided that we would develop Bankfoot Cottage into the home we knew it could be. We had found an architect and were busy making plans for just how we were going to develop Bankfoot and were really happy with our decision. And then Helen opened that magazine. As I drove up the 3rd of a mile driveway for my first visit to Dryderdale Hall, I was immediately taken by the flowering rhododendrons and the beautiful trees that lined the driveway on the approach. As the Hall came into view I knew immediately that it had to be ours. I had fallen in love with it. All that was needed now was to have Helen feel the same. 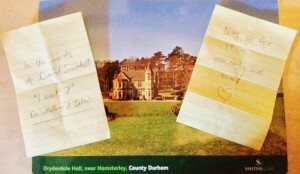 I returned home to Bankfoot to meet Helen, making a conscious decision to contain my enthusiasm for Dryderdale Hall. I really wanted Helen to make a decision based purely on how she felt about it rather than how I may feel, so I arranged for her to visit the Hall on her own. As I look back now I feel that we were both containing our enthusiasm for the sake of each other, creating a space for us to make the right choice. We made a couple more joint visits before we knew it was time to decide, the best course of action being to take a piece of paper each, write down what we had decided and then to exchange papers. Needless to say we have both agreed. So, that has led us to where we are now. Just a few days away from exchange of contracts and then completion, when Dryderdale Hall will finally be ours. I came across your blog while checking a few details on Dryderdale which was built by my grandparents. My brother is knocking up his early memoirs and Dryderdale came up. My father took us all to Australia in the 1950’s so it didn’t feature much in our lives though I spend an amazing few months there with my grandmother prior to selling it in 1964. If you are interested in the history let me know. No promises but I may unearth stuff from time to time. I hope you have a great life there!! (strangley enough this is being posted as i travel by train through Darlington back to London from Edinburgh. Any history would be great. Please email me at info at dryderdalehall dot com. Have a nice train journey. Congratulations on purchasing a beautiful home! If I’d had the money and lived in the area, I would’ve bought it too. My father (Christopher Graham Hodgkin) spent some time at Dryderdale as a young boy. My Great Great Grandfather owned Elm Ridge (now a Methodist church) until 1926 when the family had all moved away – mostly overseas. When the Japanese arrived in Malaysia in 1941, dad, my Grandmother and dad’s siblings were evacuated, leaving my Grandfather (Ernest Pease Hodgkin) in Changhi. They were initially evacuated to England where Dad saw Dryderdale. Eventually, they ended up in Australia because they were told that is where POWs would be brought to. They arrived in Perth in 1942 as refugees and stayed once my grandfather was released from Changhi. In 2007, my parents came to visit me here in England and we came to visit the house. The house was no longer taking guests, but we were invited to see the grounds and the outside of the house. Dad wandered around the house in awe, remembering much of the place. It was Mark’s family they were visiting. You probably know that the architect was Alfred Waterhouse who married Elizabeth Hodgkin. He designed the Natural History Museum in London amongst other notable buildings. Alfred Waterhouse eventually moved to Yattendon in Berkshire and built Yattendon House. I now live just down the road in Lower abasildon. I hope you and Helen have an enjoyable life in the house. Apparently, there’s a ghost. She’s a Hodgkin, so just ignore her and you’ll be fine! Although there are no plans to take in guests, I hope you won’t mind if the occasional old family member pops up to see you. You’ll have our spiritual support for keeping a family house alive. Thank you. Thank you for your good wishes, and yes, we wouldn’t mind if the odd family member popped by. No sign of the ghost yet!